SYRACUSE, NY (WRVO) – Black Friday marks the unofficial start to the holiday shopping season, and wearable technology that boosts health tracking benefits are among the most marketed items out there. One of the biggest features on the recently released Apple Watch is an electrical heart rate sensor that can take an electrocardiogram using an EKG app. The app is expected to be released by the end of the year. Dr. Russell Silverman, a cardiologist with St. Joeseph’s Health in Syracuse, said it doesn’t replace the 12-lede EKG you get in a medical setting, but it can tip people off to a serious situation. If someone is suffering from something like cryptogenic strokes, they can seek immediate treatment which improves stroke outcomes dramatically. Silverman said this kind of technology is already available, but the watch is more affordable, making it more available to the general population. 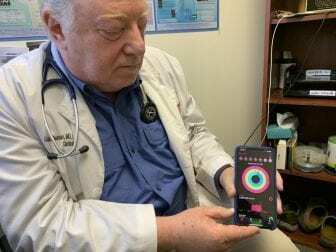 He said there are other health related apps out there to help medically vulnerable populations, like the capacity to record when a person falls. He also advises some patients to use mapping apps, so family members can watch their activity if they are out for a walk. The only piece of technology Silverman said isn’t quite accurate are the ones that count calories, although they can be a good baseline. Silverman has been a cardiologist for almost 40 years. He said technology won’t put him out of business, but can be a game changer for many patients.